In the increasingly competitive world of ecommerce, we tend to focus on what’s right in front of us: initial conversions. Getting visitors to take the plunge. Guiding them down the funnel until BAM. They convert. Mission accomplished. Bring out the bubbly. Except that’s completely wrong. Initial conversion isn’t the end; it’s just the beginning. Sometimes we think of ecommerce as a sprint. We accelerate full speed ahead toward initial conversion; once we’ve hit our mark, we slow down. Even though that approach is helpful in the short term, it doesn’t address larger issues. Ecommerce isn’t a sprint towards conversion; it’s a marathon of lifetime value. As we’ve discussed in the past, converting a returning customer is 5-10x more cost effective than converting a new one. 1 So once a customer converts initially, retention becomes the name of the game. Lifecycle campaigns are an excellent way to re-engage customers who have previously bought from you. By leveraging information gathered from previous interactions, you can target them far more effectively than you could a brand new visitor. Some products have a natural lifecycle, which understandably makes them ideal candidates for a lifecycle campaign. Goods in the health, beauty, and food sectors are often the simplest to figure out because they require the user to restock on a regular basis. 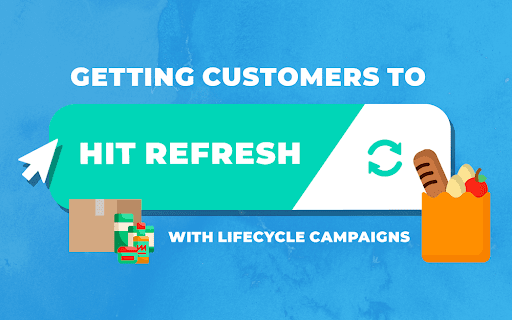 In this case, Lifecycle remarketing can be a simple as sending a timely email asking “ready to re-order?” Better yet, if it’s a product they’ll use every month, offer to set up a recurring order. For best results, send an email several days before the supply would be expected to run out, a second on the day of, and a third the day after. But what about goods that don’t need to be regularly replenished? Another helpful use of Lifecycle marketing comes in the form of emailed product recommendations. Instead of guessing at what a customer might want, you can leverage their past purchases to predict what they’ll be interested in now. For instance, if a customer buys a phone, an email recommending accessories or an extended warranty could be mutually beneficial. For fashion, send accessory suggestion that complement a recently purchased piece. Similar approaches can be used for furniture, home goods, and numerous other categories. Even if a product doesn’t have an easily determinable lifecycle, leveraging purchase information can improve the accuracy of your product recommendations and raise AOV. The value of lifecycle remarketing doesn’t stop at increased sales. Asking previous customers to leave product reviews is a great way to increase your site’s public image. Lifecycle marketing is especially helpful in this regard because it helps eliminate the reporting bias inherent in reviews of any type. If a customer has a good experience, they’re likely to enjoy the product and move on. But if someone has a negative experience, they naturally want to scream it from the rooftops. Inviting customers to leave a review encourages that silent majority to speak out – and leave a positive review. Lifecycle campaigns are the very definition of playing the long game. Instead of focusing on a single conversion, they set the stage for numerous future conversions. Just as a restaurant can’t survive without regular customers, ecommerce sites need the trust and support of frequent shoppers to thrive. By engaging customers who have previously purchased, you build up a client base, grow your brand, and set the stage for long-term success.